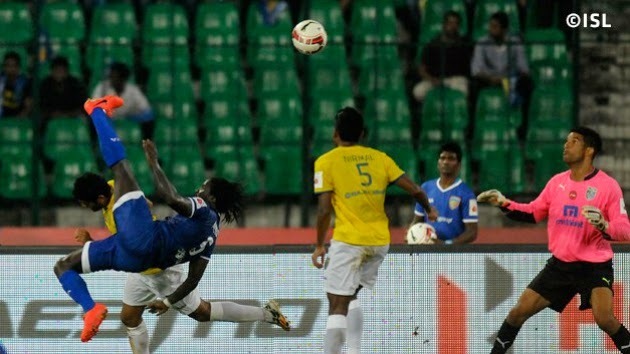 Chennaiyin FC edged Kerala Blasters FC 2-1 in a thrilling and tempestuous Hero Indian Super League (ISL) match at Chennai's Jawaharlal Nehru Stadium. They shoot up to second in the league, with six points, while Kerala occupy the bottom spot and are yet to record a point. Elano's 12th-minute penalty gave the home side the lead, before Iain Hume smashed in a 50th-minute equalizer to make things interesting. Bernard Mendy, however, stunned everyone with a spectacular 63rd-minute overhead kick for the match-winner.